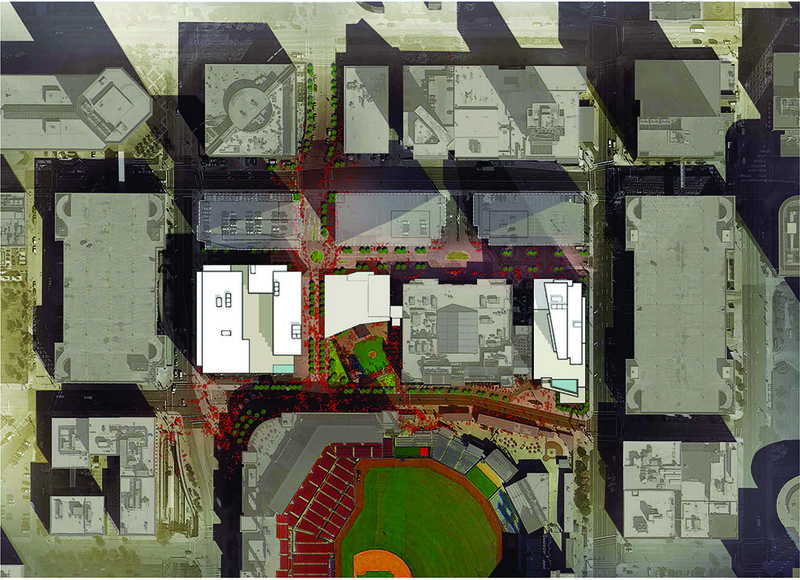 This morning the St. Louis Cardinals finally announced Phase II of their Ballpark Village development. While years behind schedule, if built as presented, the project would fulfill much of the original promise of the project. 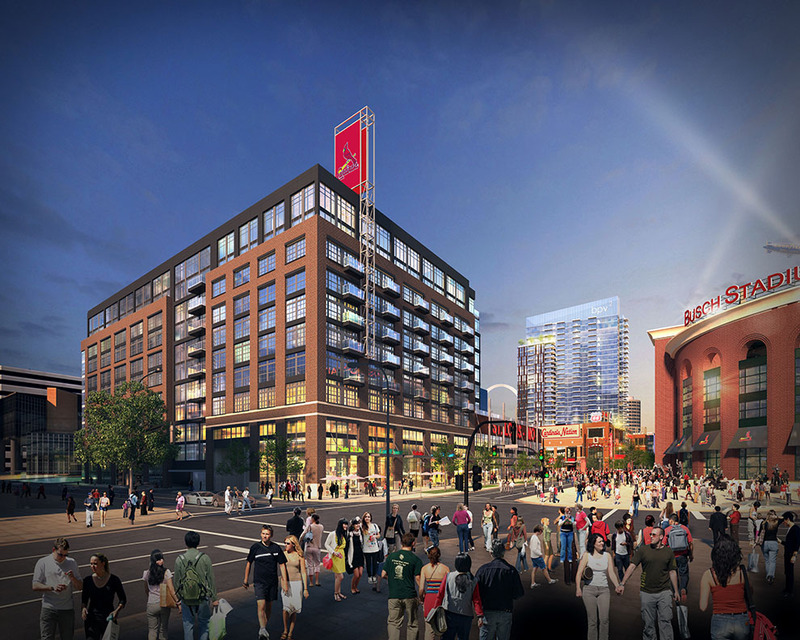 Ballpark Village phase II is set to total 550K sf, including a 29-story residential tower rising 320ft., a 10-story Class-A office building, retail, restaurants, and entertainment space. 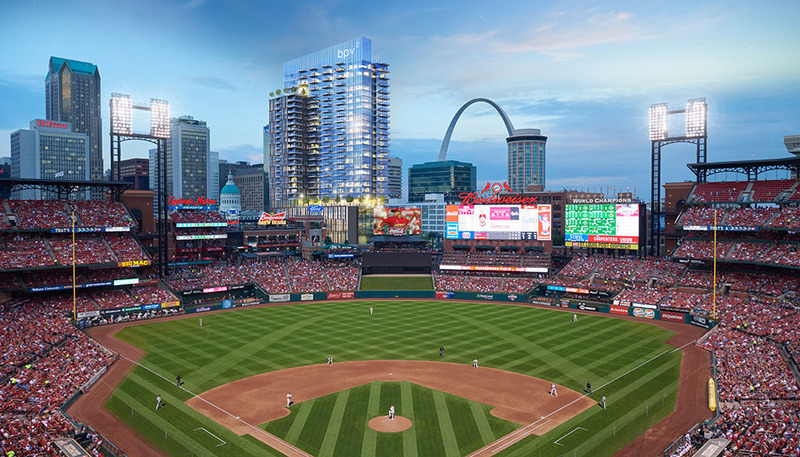 The residential tower will be located at the east end of the development at Clark and Broadway, with a view into Busch Stadium. The office tower would be built at Clark and 8th Street. Together, they would complete the streetscape along Clark Avenue. A bill being filed today by 7th Ward Alderman Jack Coatar offers an unspecified amendment to the existing development agreement with the city. Language from the Cardinals announcement appears to indicate Tax Increment Financing (TIF) will be sought, as well as an additional 1% Transportation Development District Development (TDD) tax. 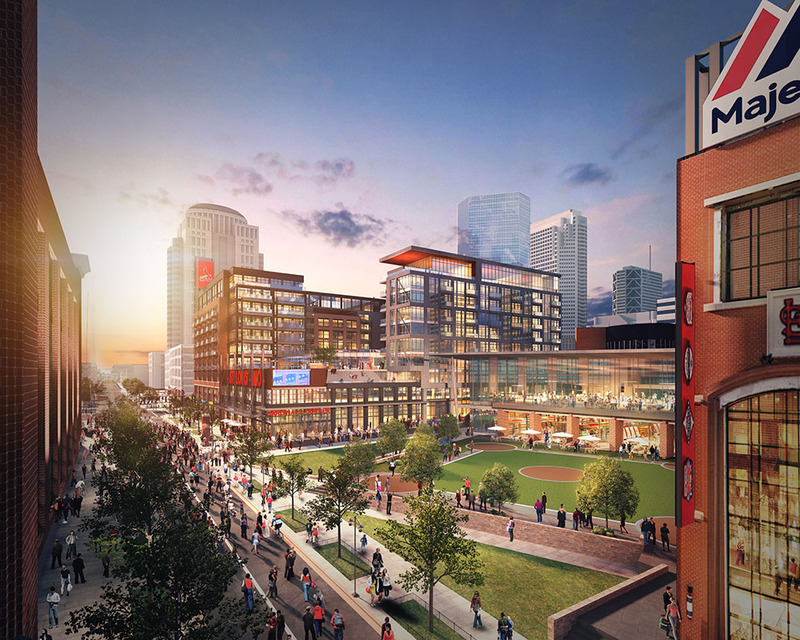 The $100M first phase of Ballpark Village was completed in 2014. While celebrated by the Cardinals, the first development completed was vastly underwhelming. The promises made to the city more than a decade ago were unfulfilled. Downtown got what is in essence a new bar district. Although charges that Ballpark Village led to the closure of other establishments may be exaggerated, nothing new had been added. 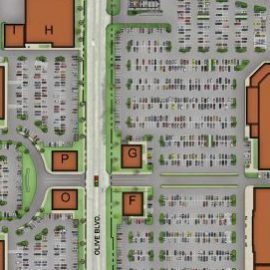 The new site plan released for Phase II appears to resurrect something of a street grid within the development site. Continuing south into the area is 7th Street, and east-west access appears to be something more than a garage access driveway. 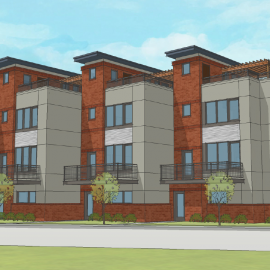 The north end of the site is planned for an additional phase. 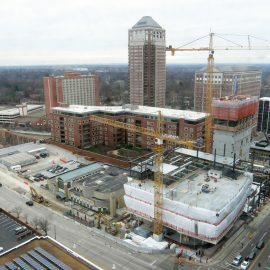 The development schedule for Phase II anticipates construction beginning late next year, with the project completed in 2019. As was done with the celebration of 10 years of the new Busch Stadium (see: Cardinals Celebrate Ten Years of Busch Stadium III With a Whopper of a Propaganda Video), the boosterism regarding economic development and community impact is a bit over the top. A lot is being promised, and a lot is being claimed on behalf of the stadium and Ballpark Village Phase I. The Cardinals released two videos announcing and detailing the next phase of development. The videos were recorded at the same time as the Busch Stadium promo. 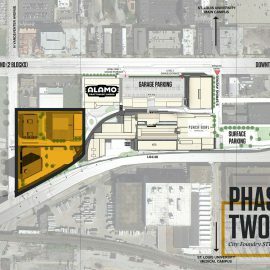 While even without knowing the details, there’s little reason to believe the city won’t agree to amend the development agreement and provide TIF, TDD, and perhaps other support, we have also been here before. 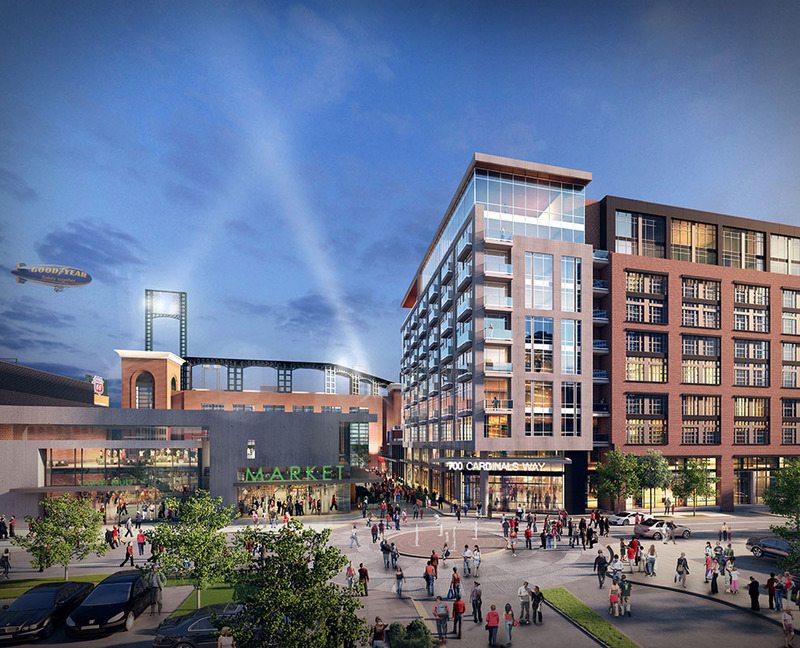 Prior announcements for development at Ballpark Village appeared air tight. The initial plan was ready to go, we were told. When Centene signed on for a new office tower, it was supposedly a clear sign dirt would turn soon. The belief that development will happen now is a combination of what appears to be a more modest development plan, and the assumption that something would eventually be built. The St. Louis Cardinals announced plans for a $220 million, 550,000 square foot second phase of Ballpark Village which will include the construction of a 29-story luxury high-rise residential tower, the first new Class-A office building built in downtown St. Louis in nearly thirty years, and additional retail, restaurant and entertainment space. 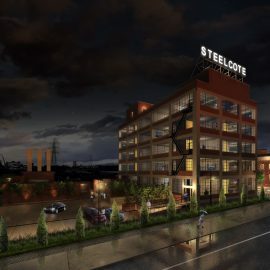 The Class A office building at the corner of Clark and 8th Street will sit right across from the bronze statues on the NW corner of Busch Stadium, and will also include structured parking below, and street level retail and restaurants. It will be the first “new construction” office building built in downtown St. Louis in more than a generation (Metropolitan Square opened in 1989). Also in Phase II will be a signature two-story retail marketplace and entertainment venue overlooking the existing Busch II Field, the signature “open space” of Ballpark Village. The marketplace will include diverse food options and other amenities to support the new office and residential tenants in the project.